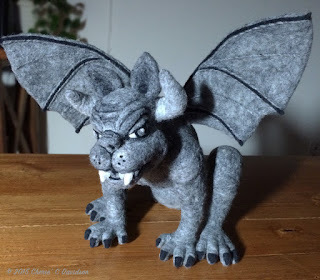 I was so surprised, and completely delighted the day I found out that Living Felt featured my gargoyle on their blog. Thank you so much, Marie! 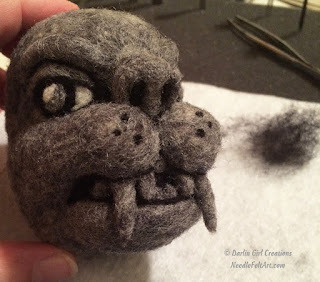 Thinking back on it, I became inspired to give a mini-tutorial of how I made my gargoyle. So, this is my first post on my new blog. Couldn't be more fitting than to start with "Garg," my little buddy! Brutus (as his owner, my brother, has named him) is affectionately known to me as "Garg," and he was one of my first needle felted pieces. He's also my largest piece to date. Being the size of a house cat, he was a bit formidable for a novice felter, but he taught me a tremendous amount, and I was very pleased with him in the end. He'll always be a special piece to me! Here are some photos of my process in creating Brutus, and a few notes about what I was thinking along the way, and why I chose to do what I did. 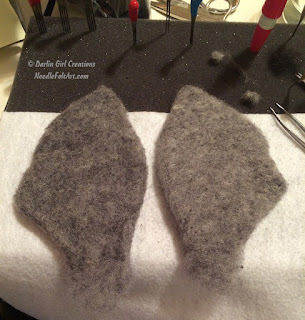 During my early projects, I learned very quickly that my favorite "go to" wool for sculptural needle felting is a nice cross batt. I use mostly the batts from the two shops I mentioned. It felts up faster and needs less finish work than a straight Merino, or top, or roving. As for my tools, I predominantly used my beloved "workhorse" needle, a 40 triangle, from FeltAlive.com. I love Kay's rubber grips. (This one has the yellow handle.) I've since adopted her 40 short as my go-to workhorse. It's less fragile and goes like crazy. But I digress... the other tool I used was the Clover pen with the three needles. But I used it more for the core and larger areas to help go faster. I didn't have my Clover 5 needle punch yet, or I would have used that, or a double 40 or 40t spiral (which I adore!) from FeltAlive. That was it. Simple tools, few supplies. Part of what I adore about sculptural needle felting! 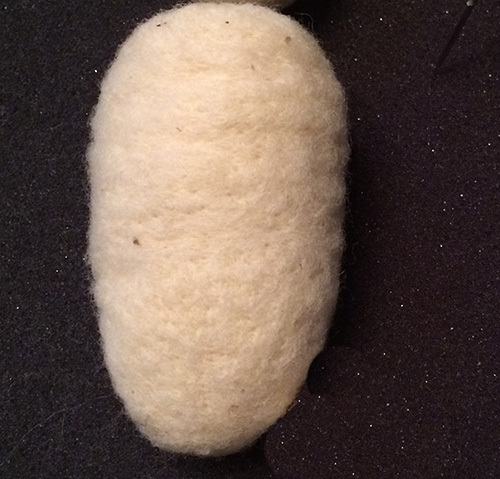 All my heads start the same way, as a core wool "egg." More precisely, an egg shape. 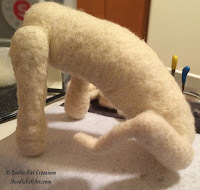 I build up the features in the skin tone color and then finish covering any core wool with skin tone to match it all up. As you can see on the right, the skull (what was the core "egg") has brows, huge cheeks and other parts added, and I'm beginning to lay in the areas for the details. I think one of my favorite things to work on are the eyes. More than anything else, the eyes give personality and life. Once I get the eyes completed, my project becomes something special, and is a complete character...even when I haven't started its body yet! A face only a mother could love? Well, I loved it, too! You'll see the eyes are needle felted, and I think the expression in them is just right. Cautious, slightly wary, a tad menacing, but open and direct and unflinching. Yep, just what you want in a trustworthy gargoyle! The teeth, at this point, were nearly finished. I did a little refining and experimenting, and decided to go with the stone color instead of white. (After all, he's a "stone" gargoyle.) However, for some depth, I did lighten up the gray for the teeth and use a lighter gray on his horns (soon to come), so he wouldn't be "flat" looking. It was subtle, but worked very nicely. 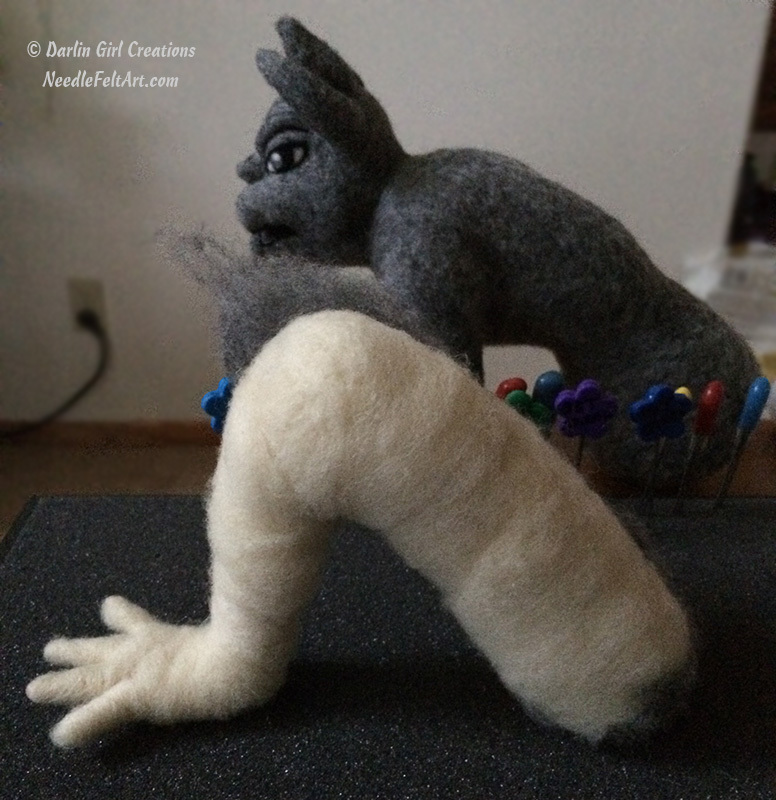 Once I got the ears, horns and final details of the head completed, I set it aside and started making the body core. This photo to our left is of the very basic core structure before it was built up very far. There is no wire armature. It's all tightly felted core wool. The body is two large "logs" wrapped and felted. Each front leg is one "log" piece. The hind legs...well, it turns out these that you see didn't work out. Sometimes that happens even with a great deal of experience. 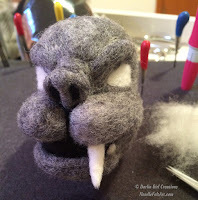 But this was only my third needle felted project at this point, so I was learning as I went. And my first significant roadblock were those confounded back legs. They became the temporary bane of my existence, I can tell you. 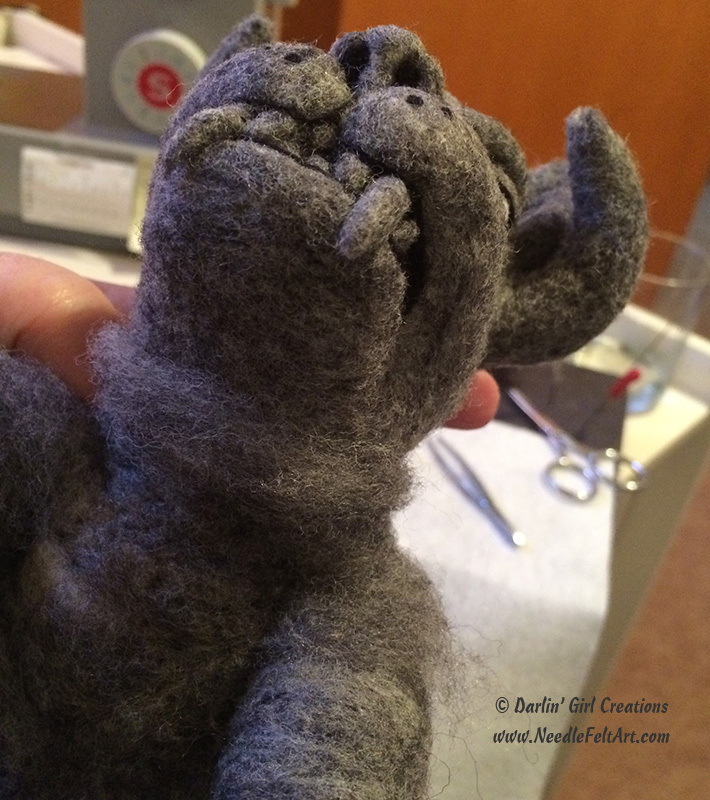 Once I had the body the size and rough shape I started felting in some skin tone, a beautiful heathery gray from Living Felt. Their MC-1 cross batt in Storm Gray. Loved it! This gave me a very sturdy center and a well-defined knee joint. 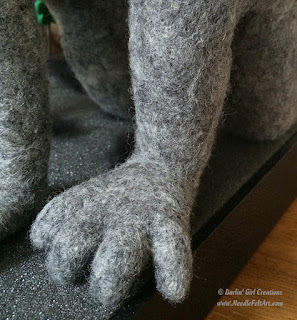 But it also gave me a great "bone structure" for the claw-paws, which I wanted to look beefy and very strong. The leg wire is cloth-covered florist's wire, and the toes are pipe cleaners. I took strips of core batt and started wrapping the entire armature. Since I needed a lot of bulk at the thigh and knee areas, I didn't start wrapping the feet until I had most of the size and bulk in place for the leg. Then the final couple wraps I included the feet, going around each toe. I would wrap and stab, wrap more and poke more, until I got pretty close to what I wanted. And now I was happy with the back legs! As soon as I started adding the skin color, I knew I'd found my answer. I just couldn't have been happier with the way the paws came out, and once both legs were covered with "flesh" I attached them and got his headless body in good shape! The moment I stopped stabbing and knew the body was finished (except for claws and wings), I was instantly impatient to get his head on! I've found since this little guy, that I always get very impatient to put the head on. Not only does it bring the character to full life, but it's the final stage, my favorite stage... the fine details! I love that part! To do this, I leave fringe on the neck and on the head both, and pull it back when I put the two together with a deep anchoring series of stabs with my largest needle (a 36 triangle), which is very sturdy...usually. I carefully attach the head to the neck/body with a series of deep stabs. It only holds things in place lightly, but then I go all the way around with my workhorse needle, my 40 rectangle, and poke (still with the fringe pulled back) around the edge of the head into the neck in close felting jabs, and then reverse the process and go around stabbing from the body/neck into the head. This attaches the two pieces pretty well. So, I repeat, just to be sure. The last portion of this little beauty... his wings. (What's a gargoyle without big wings?) I took two piles of batt, each the size of my open hand plus a little more, and about three layers/pulls thick, I laid them side by side, and stabbed the shape in both, to keep the size and shape as similar as possible. I thought about making a quick paper pattern of the outline that I could stab, but...well, I often get impatient with extra steps, especially at the end of a project. I think the paper template would have saved me some extra stabs to get them consistent, so that might be a good tip for those of you who want to make matching items, like ears or such. Anyway, once I stabbed the outline into the fluffs, I used my Clover 5 needle punch to flatten inside the stabbed outline. I then pulled the loose fibers inward to the flattened area and stabbed, pulling ever so gently to keep the outline stuck to my foam, to give me a consistent guide. I then pulled them up from the foam and started perfecting the shape, thickness, etc., so they were ready for definition and detail. As you can see in the bottom (finished) photo, I added felted veins to give some depth and dimension. The black lines balanced his colors a bit, I think. And they also aided me in covering up the pipe cleaners I felted to the top (long) side of each wing. 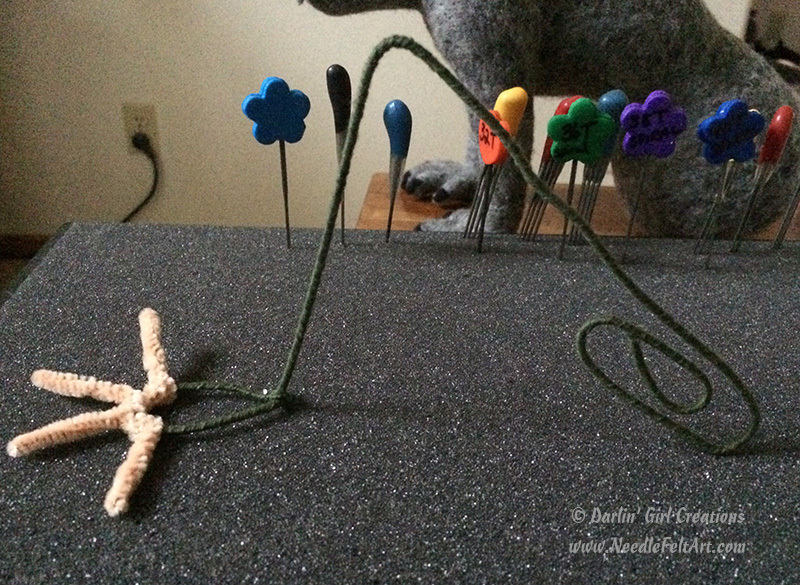 They stood up on their own, but wanted to lean forward, so just the pipe cleaner gave a little stability and pose-ability, and that little bit did the trick. And, here he is, all finished. If you click the photo for a larger image, you can see the veins in the wings and the way I decided to do his talons, more of a menacing toenail rather than a claw. But that's one of the great things about gargoyles...they can be whatever you want them to be! No two are alike, and they can be any combination of creatures you choose! I hope you enjoyed this mini-tutorial, and please, if you have any questions, feel free to leave them in the comments and I'll help however I am able! Thanks for reading and sharing this love of needle felting (and gargoyles)!